The Andes are the longest mountain range in the world, stretching 7,000 km (4,350 miles) down through South America. Glaciers are scattered along the length of the chain and some of the accumulations of ice are significant on a global scale. Covering an area of over 12,300 km2 (4,700 sq miles), the Southern Patagonia Ice Field is the world’s second largest single ice field outside the polar regions. 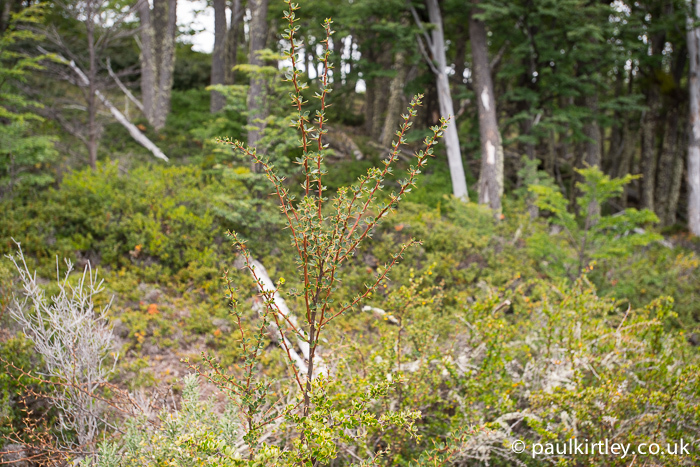 Accumulation of snow is due to the strongly oceanic climate of southern Chile, with prevailing westerly winds and storms coming off the Pacific Ocean, hitting the Andes and creating a high level of precipitation, both in terms of total amount and number of days per year. 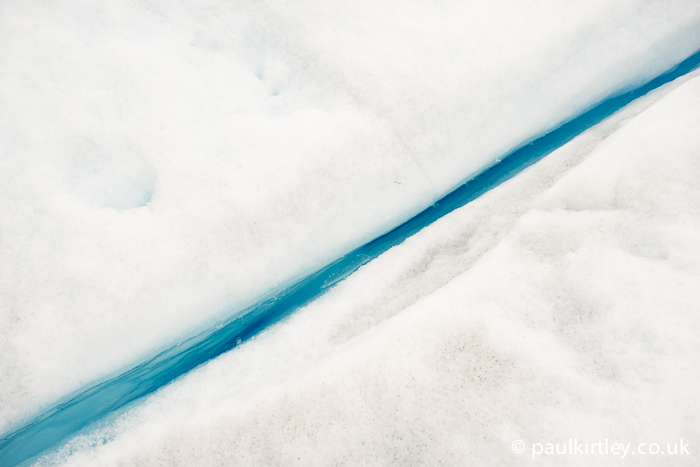 Glaciologists estimate it takes 8-10 years for this snow to form into solid ice. The ice then flows downhill off the edges of the ice field like dry rivers. Some of the ice flows west, into Chile’s fjords on the Pacific Ocean. 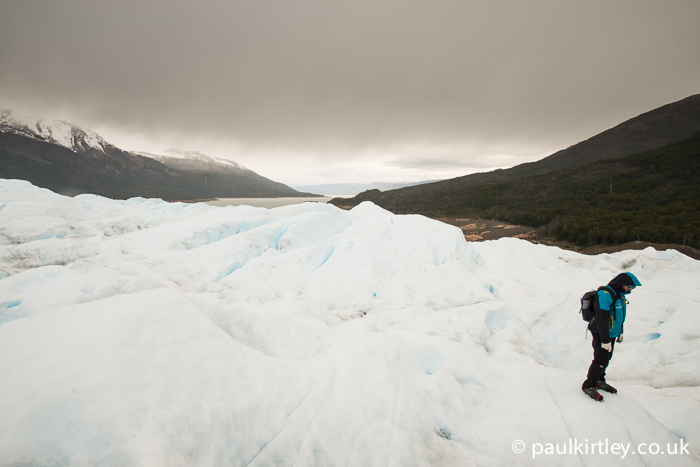 Some of the ice flows east, feeding Argentina’s Lake Viedma and Lake Argentino, the waters of which ultimately reach the Atlantic ocean via the Santa Cruz river. 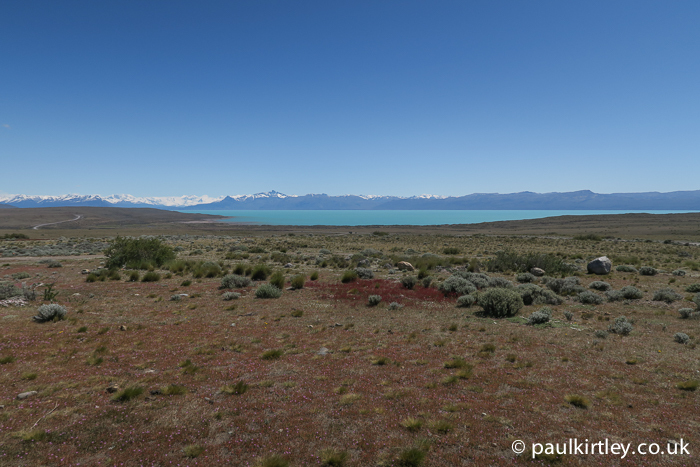 Lake Argentino, fed by glacial water. Photo: Paul Kirtley. 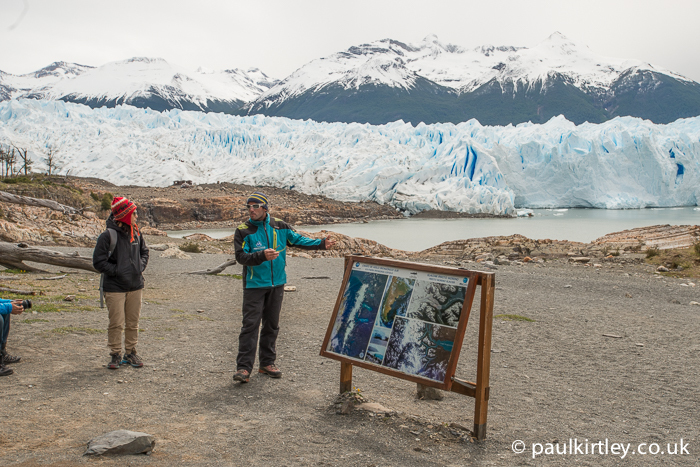 Named in honour of Francisco Pascasio Moreno, an outstanding Argentine explorer and naturalist who played a major role in exploring this area of Patagonia in the 19th Century, as well as defining borders with Chile, the Perito Moreno glacier sits in the southern section of Los Glaciares Parque Nacional. 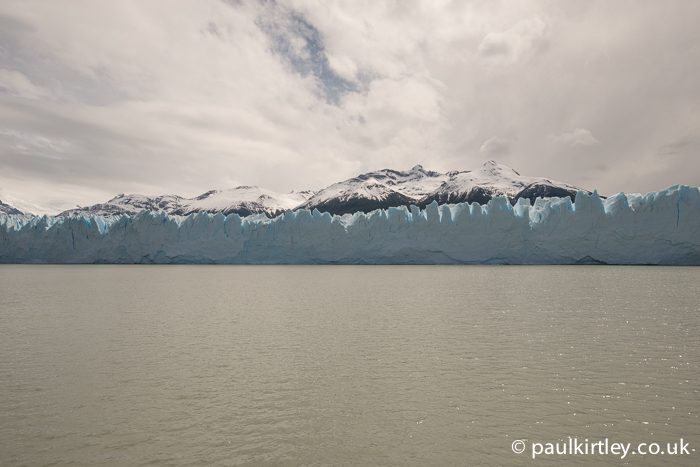 Glaciar Perito Moreno is something of an oddity in that it is a stable glacier while others around it (such as Upsala) are receding visibly year by year. 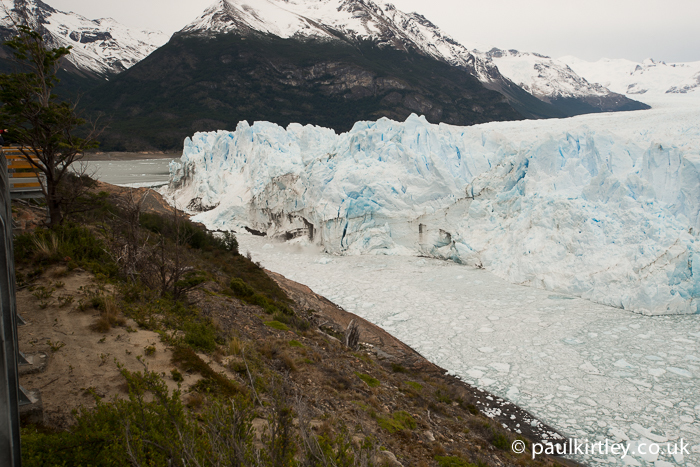 By contrast, Perito Moreno has not changed in size significantly in the last 90 years. 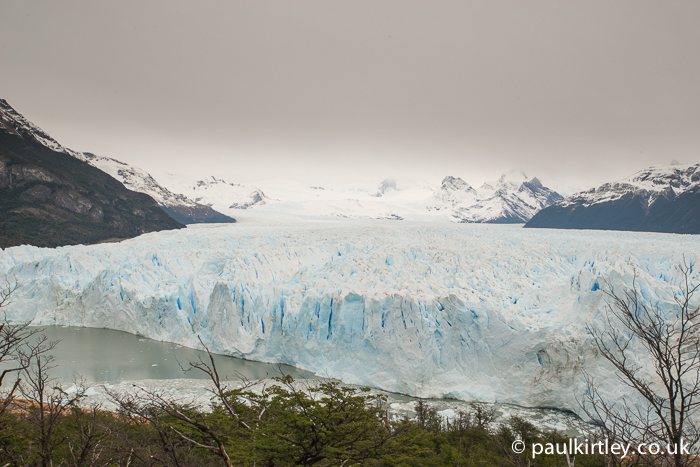 Along with only a small number of other glaciers in the Andes, Perito Moreno appears to remain in equilibrium, while most glaciers have been receding since the mid 1800’s, and rapidly so since the 1980s. 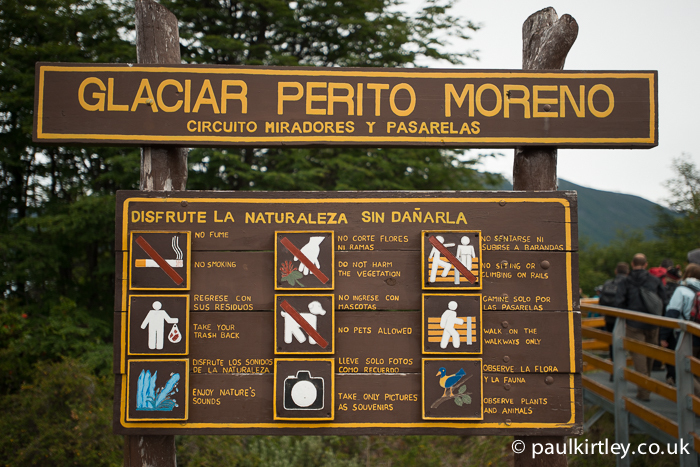 Perito Moreno glacier has not been without other threats, though. 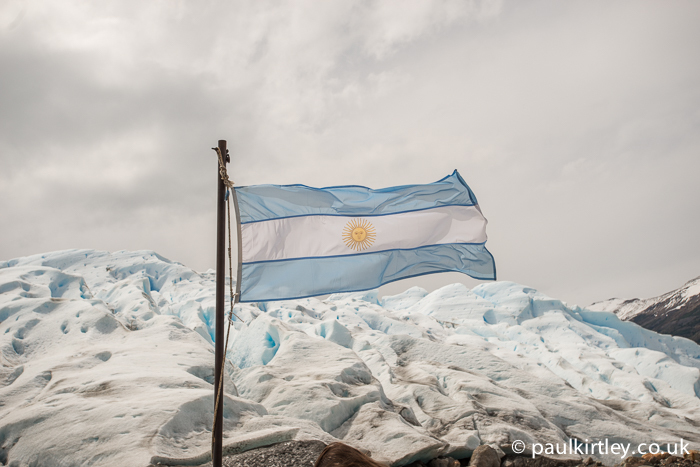 The controversial plans for a massive hydro-electric scheme downstream of the glacier have raised concerns over the potential effects on the glacier itself, specifically due to potentially more variable water levels in Lake Argentino. 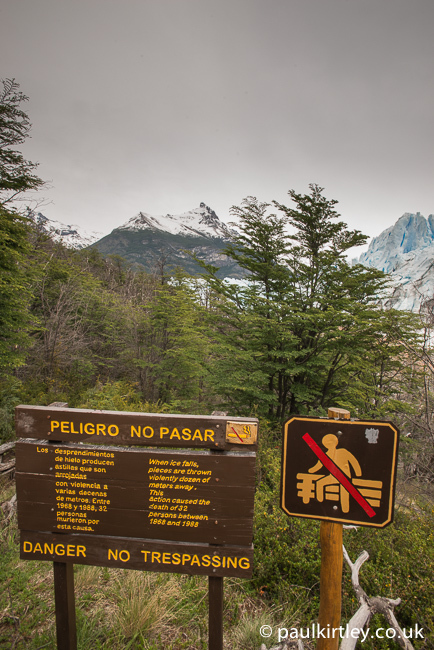 That the authorities here would risk the glacier along with the surrounding wilderness areas with such a scheme is all the more surprising, even just from an economic perspective, given its significance within Argentine tourism. 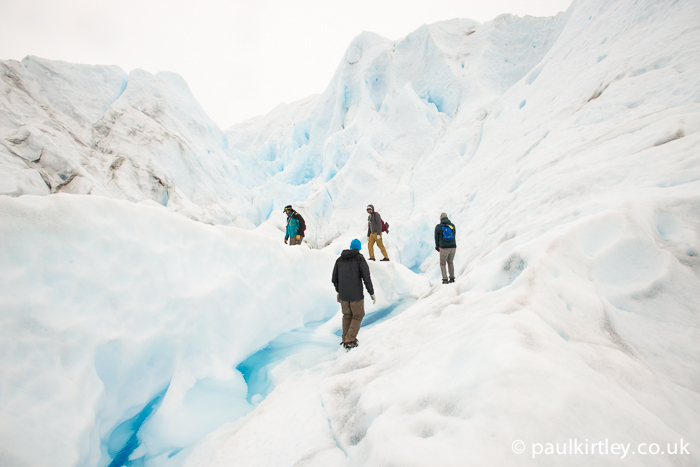 It is the most visited glacier in the park and has become one of the most important tourist attractions in Patagonia. 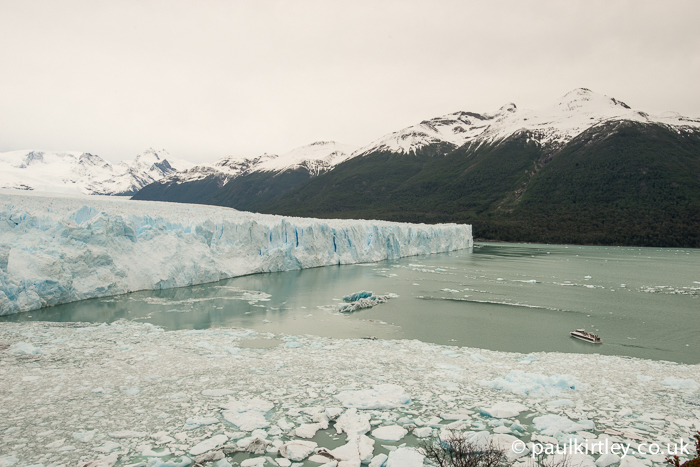 Moreover, Perito Moreno is considered one of the most beautiful glaciers in the world and Los Glaciares National Park in which the glacier sits, is a UNESCO World Heritage Site. The potential damming of the Santa Cruz river is the subject of a documentary The Last Explorers On The Rio Santa Cruz, made by Leon McCarron and Tom Allen, who were guests on episode 9 of my podcast. 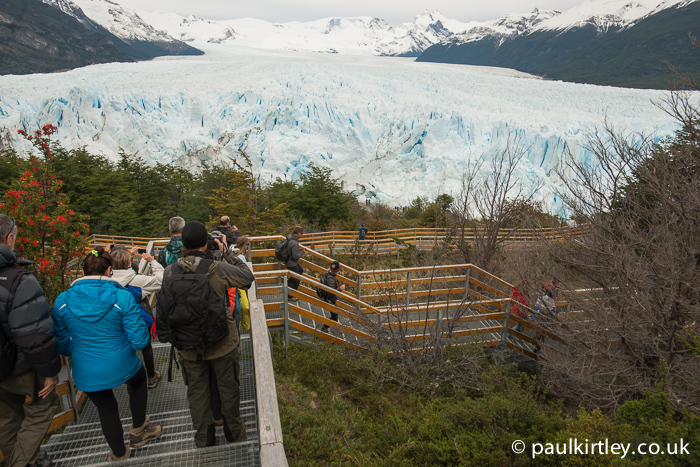 As well as the natural beauty of the park and the glacier, its popularity is due in part to relatively easy accessibility. 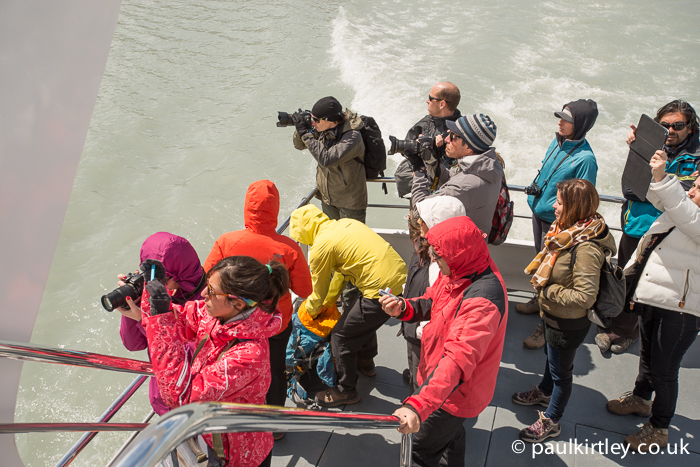 Plus the glacier moves quickly (2 metres per day at the glacier centre line) and so, has many calving events. The glacier is also famous for periodically blocking the flow of water through the Canal de los Tempanos which connects Brazo Rico with the main body of Lago Argentario. 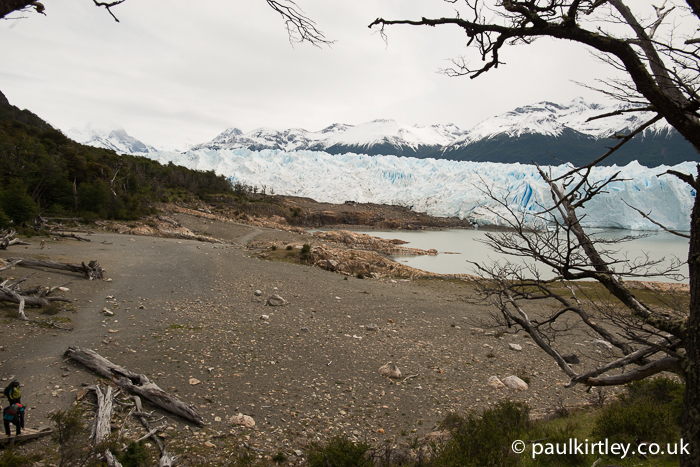 Since earlier in the 20th century, the glacier has often advanced to be in contact with the Magellan peninsular. 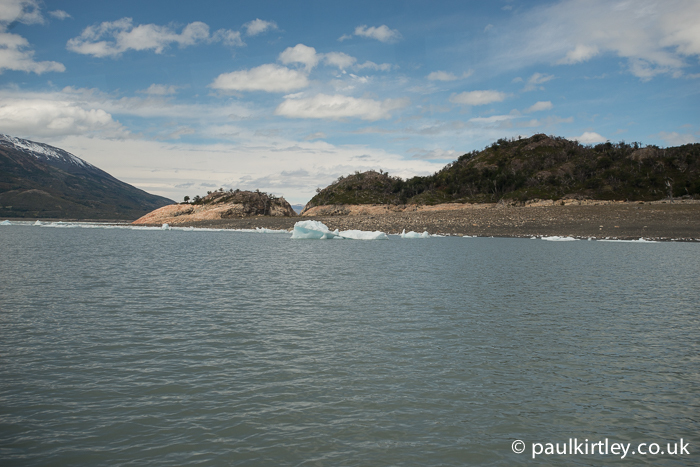 When the glacier reaches the peninsula, it splits the lake. The main section of the lake drains into the Santa Cruz river, and ultimately the Atlantic. The section of the lake on the other side of the glacier (Brazo Rico) drains into the main section. 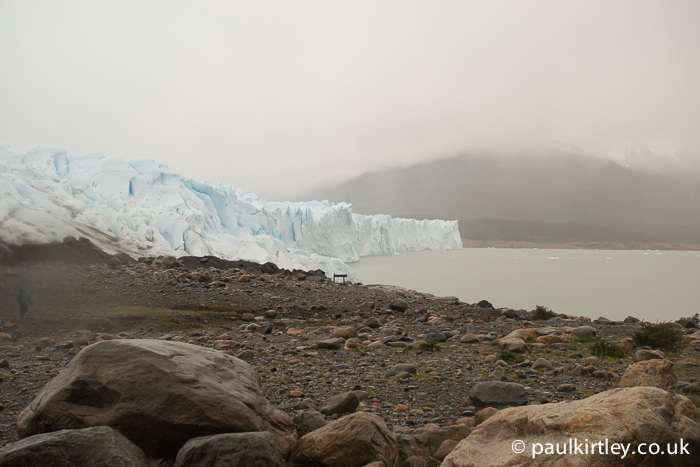 So the glacier effectively forms a dam, splitting Lake Argentino and, when it does, water on the Brazo Rico side starts to rise. When we visited, the water in Brazo Rico was 2 metres (6 feet) higher than the other side. Eventually, the water erodes the ice where the glacier meets the land and the lake levels equalise. An arch of ice is often created, with the water flowing underneath. In the recent past, it has ruptured every 4-5 years. In 1966 the water rose an incredible 27 metres above normal before the ice was breached. 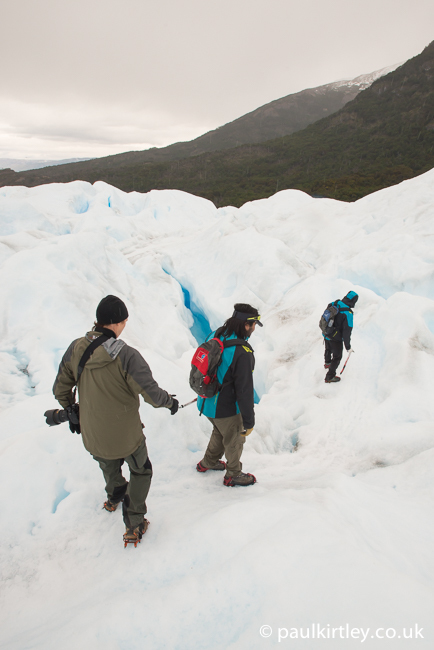 Visiting the glacier is straightforward. 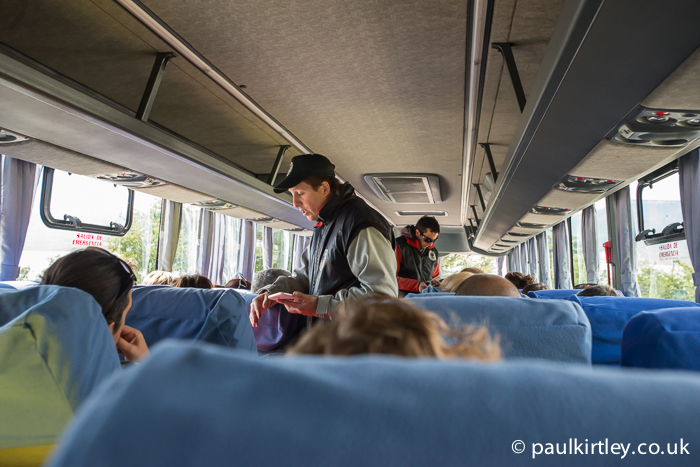 Several companies offer day trips from El Calafate, about 1.5 hours bus journey away. 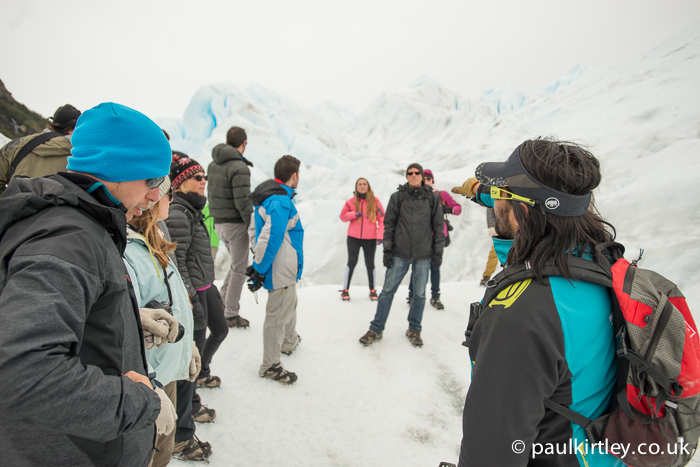 It’s also possible to book walking tours on the glacier as part of the visit – either a short (90 minute) or longer (4 hours) walk. 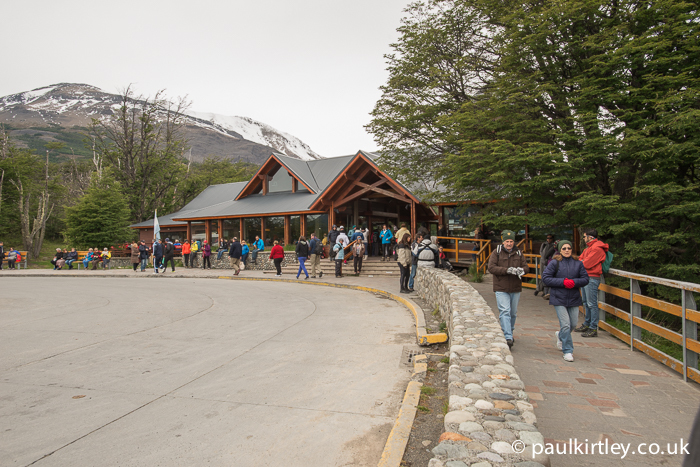 There is a visitor centre near the glacier, on the peninsular. 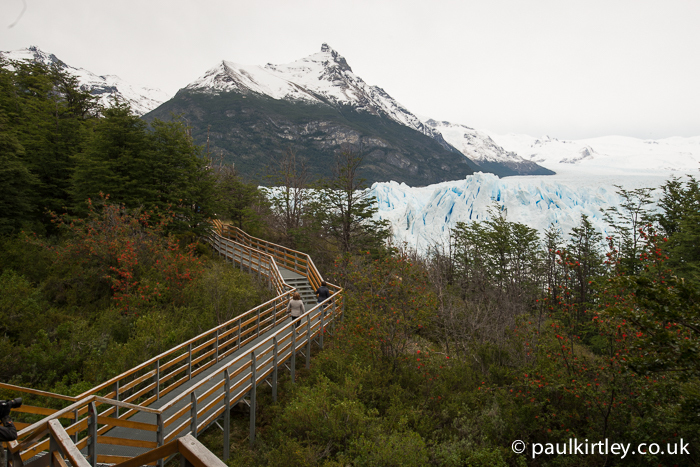 Walkways have been constructed to limit erosion on the hillside opposite the glacier, as well as to provide a safe vantage point from which to view the glacier. Extensive walk ways have been constructed to limit erosion as well as for reasons of safety. Photo: Paul Kirtley. 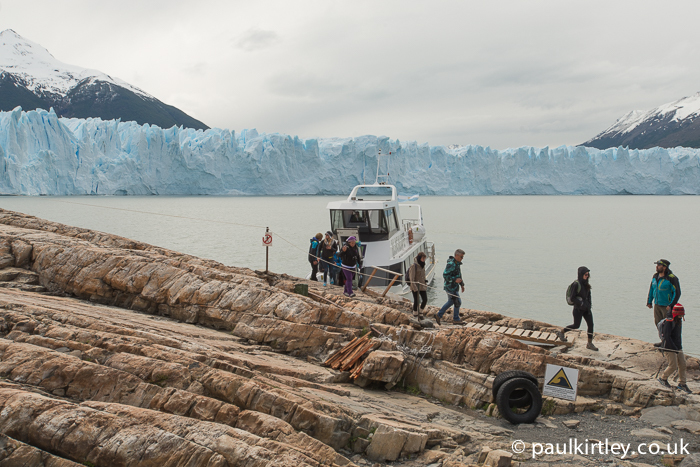 The guard rails also prevent people getting too close to the glacier, or even the shores of the lake. In the past a significant number of people have been killed at the site due to falling ice, either directly or due to dangerous waves hitting the shore as ice falls into the water. 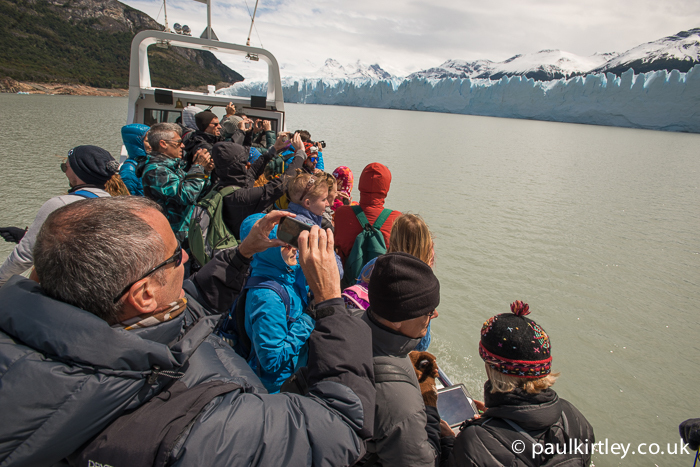 When you see the glacier at first it is difficult to gauge the scale of what you are viewing. 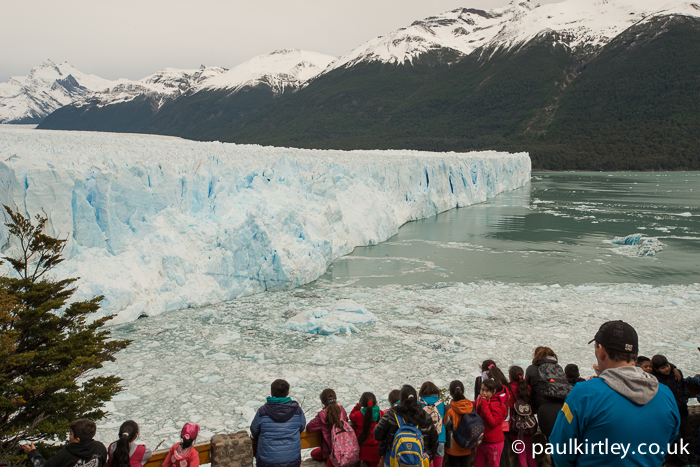 At the terminus of the glacier, there is about 70 metres (230ft) of ice above the water. You better appreciate this scale when you see a boat approaching the ice. What you still can’t see, however, is that there is another 100 metres (330 ft) of ice below the surface of the water. 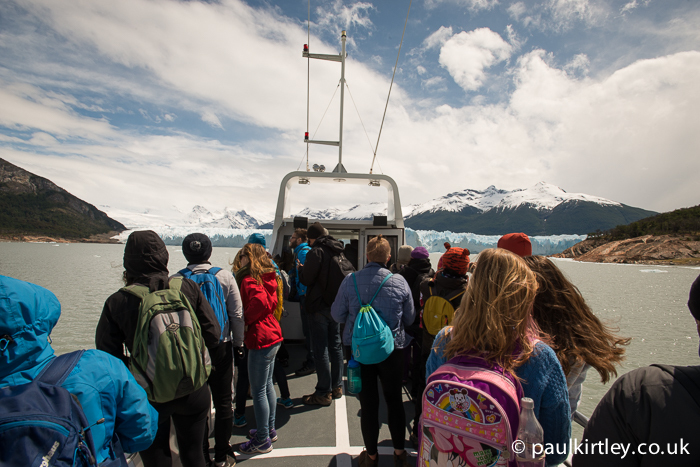 Given the popularity of the glacier as a tourist attraction, we had expected the visit to busy, in particular the walkways directly in front of the glacier’s snout. 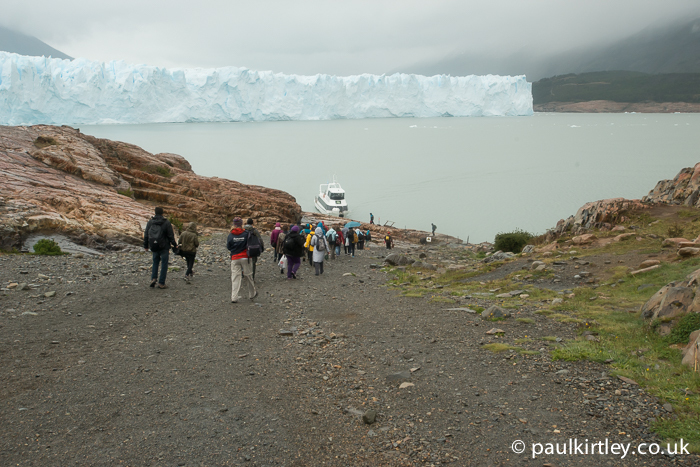 Rather than just visiting the walkways, we’d booked onto the short walking tour on the glacier. 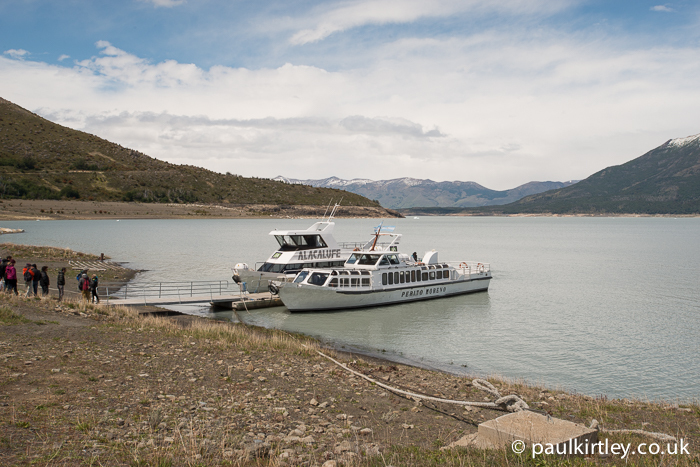 Including the bus journey from El Calafate and back, this is a full day’s excursion. 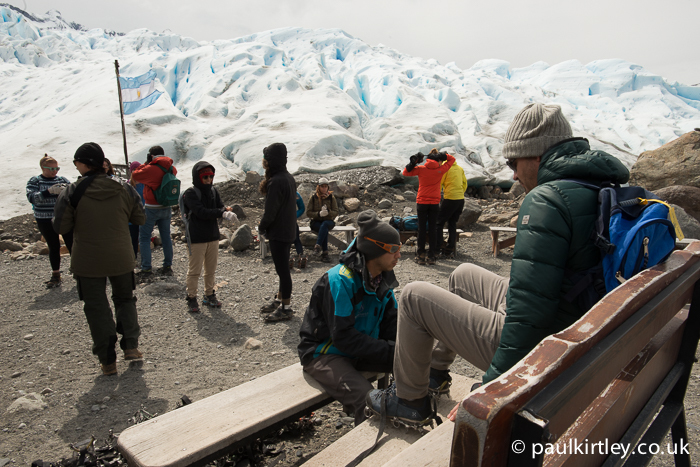 We had wanted to take the longer walking tour (less time on the walkways and more time on the glacier) but even though we attempted to book in advance, there was no availability when we were there. So, we booked onto the shorter walk. On entering the national park, there is a fee to pay. This is in addition to the cost of your tour. The bus stops here and National Parks officials board the bus for everyone on board to pay. 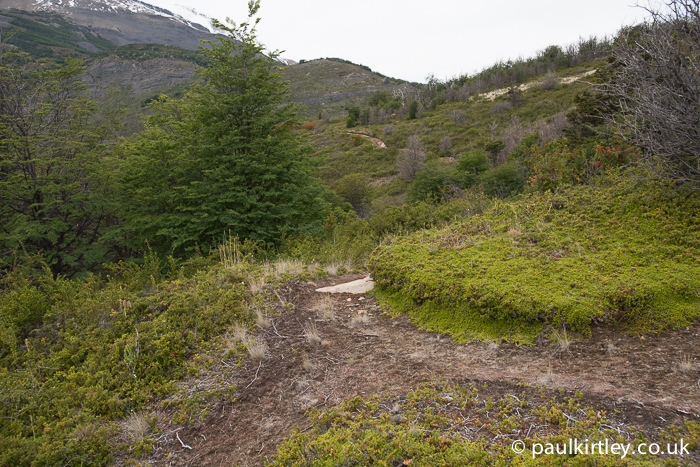 Then the bus proceeds along the increasingly winding road to its end, opposite the glacier’s terminus. Arriving at the visitor centre, it certainly was busy, with lots of people milling around. Before we disembarked from the bus a tour guide came on board the bus to inform us she would meet us outside the centre in 10 minutes. This gave people the chance to grab a coffee or have a quick toilet break at the centre. It also added to the throng of people already milling around. The visitor centre. Photo: Paul Kirtley. The tour guide then walked us down towards the walkways and the glacier. We stopped at a map and she explained the different routes we could take and the time it was likely to take us. There was another group being briefed nearby and it was hard to hear the tour guide. 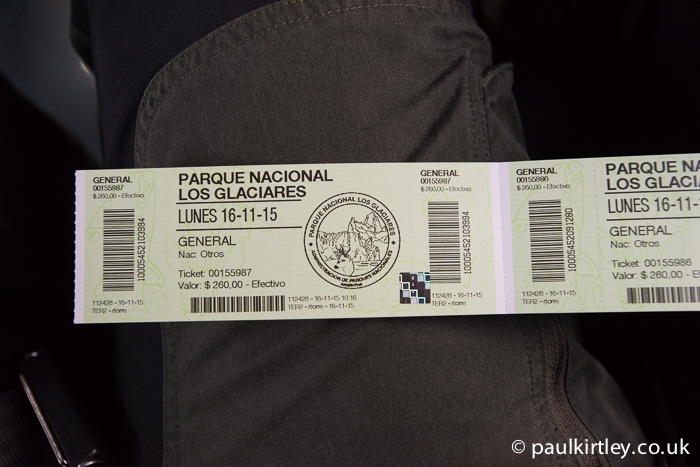 We then had 90 minutes before we’d be picked up to be taken for the walking tour on the glacier. 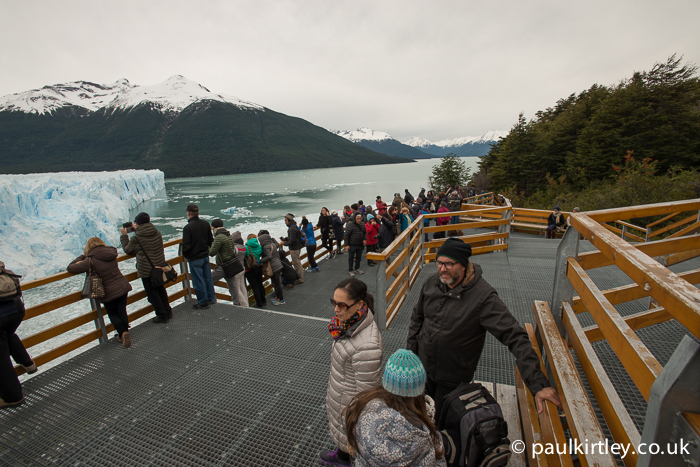 We then wandered the board walks, taking photographs and trying to find a relatively quiet spot to listen to the glacier. It was periodically creaking and cracking. Sometimes some ice would fall into the water with a roar. Most visitors seemed oblivious to this though and there was incessant chatter pretty much everywhere we went on the walkways. Worst were a group of American college students who were very noisy indeed. They definitely hadn’t interpreted the sign which said “Enjoy nature’s sounds” in the same way we had. All good advice, including “Enjoy Nature’s Sounds”. Photo: Paul Kirtley. Descending towards closer vantage points. Photo: Paul Kirtley. 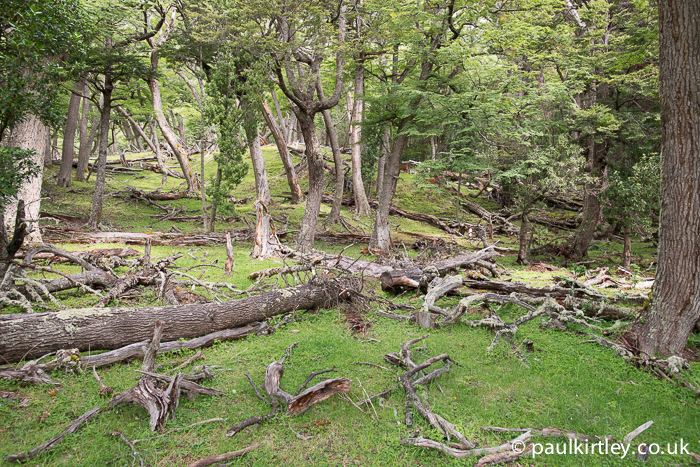 Eventually, we swung out from the central section of viewing areas on a longer route and found some peace and quiet. 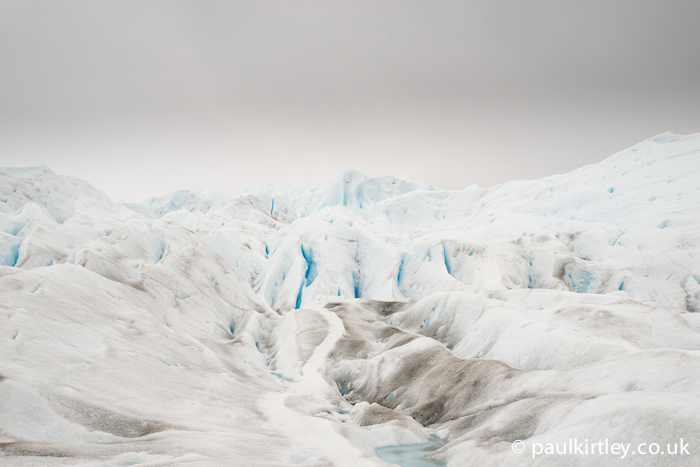 Here we could properly hear the sounds coming from the glacier and gain some palpable sense of the colossal forces invoked by the literally glacial movement of the mass of ice before us. Quieter walkways. Photo: Paul Kirtley. 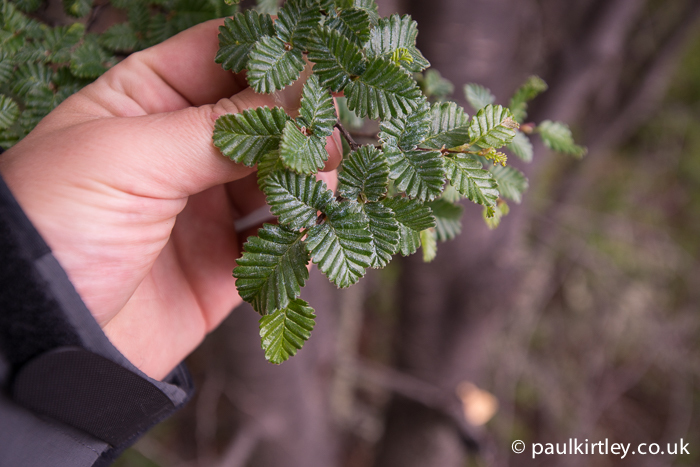 Here we could also hear the calls of local passerine birds flitting around the trees and shrubs, which consisted largely of Calafate, Berberis microphylla, Notro, Embothrium coccineum and Lenga, Nothofagus pumilio, relatively common species here but ones I was still familiarising myself with at this stage of our trip in Patagonia. 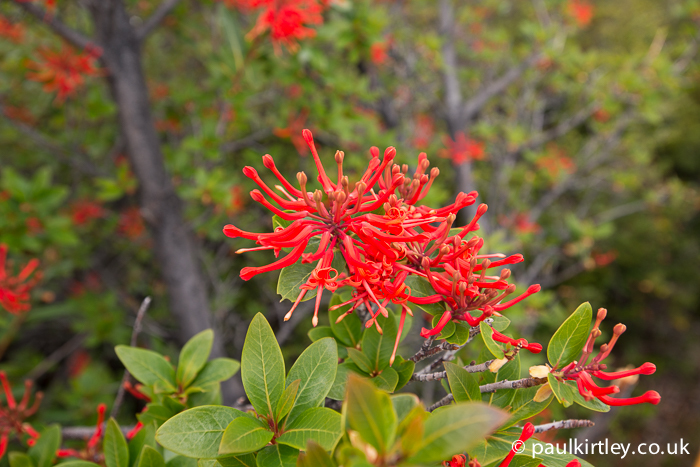 The vibrant red flowers of Notro, the Chilean Firebush. Photo: Paul Kirtley. So this time was a nice pause in what was otherwise a day of many crowds. 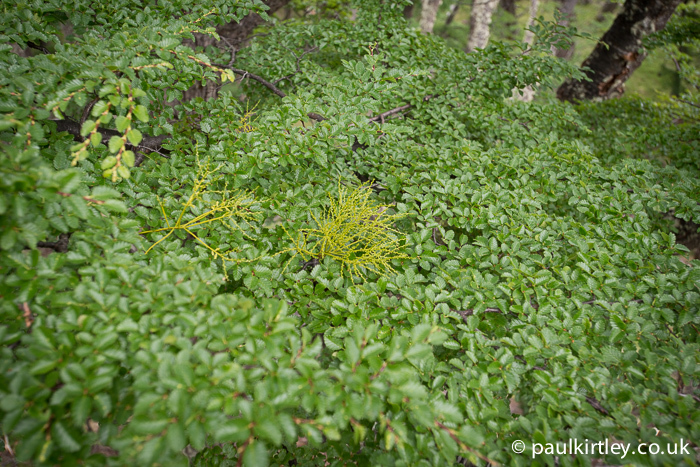 Also, present in the Lengas in this section of our wanderings on the boardwalks was what I thought was a mistletoe-like growth on some of the trees, which did in fact prove to be Misodendrum punctulatum. 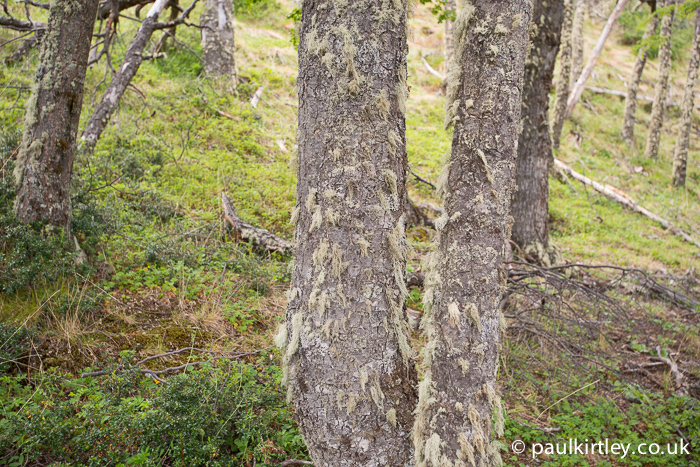 There was also plenty of “old man’s beard” Usnea lichens, a testament to the purity of the air here. We met our coach again outside the visitor centre and were taken a short drive down to a dock where a couple of boats were moored. We disembarked and queued up to board one of them in order to cross the Brazo Rico, the other side of which marked the start of our walk. 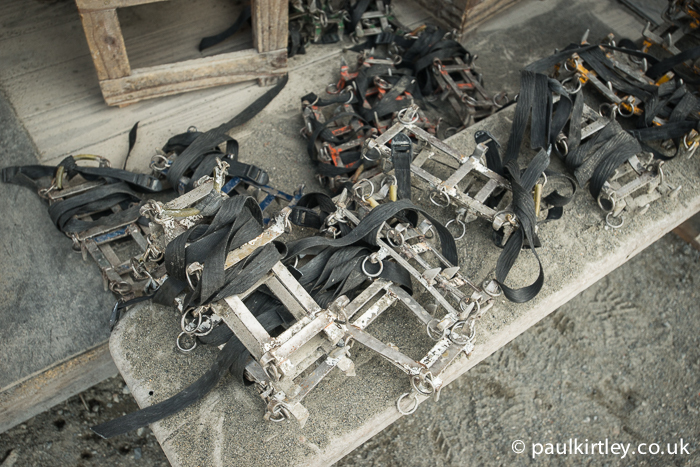 The somewhat industrial-looking yet effective crampons. Not quite as refined as my Grivel G12s… Photo: Paul Kirtley. Our English-speaking group was split further into three groups. 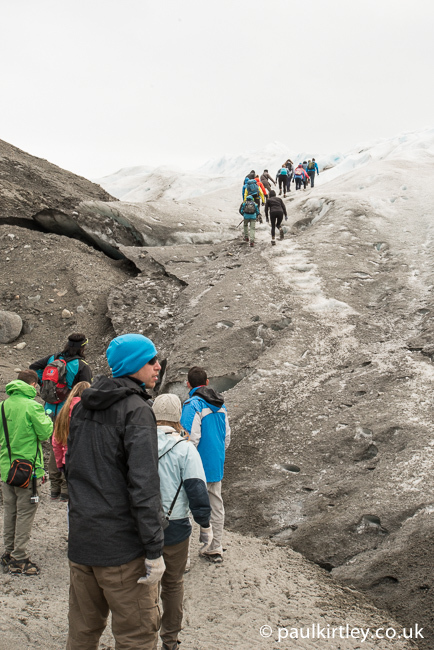 Each of these groups was assigned two guides to take them onto the ice and each group headed off to a different area in the same vicintiy of the glacier. We walked a little way further up the lateral moraine then headed up onto the ice itself. 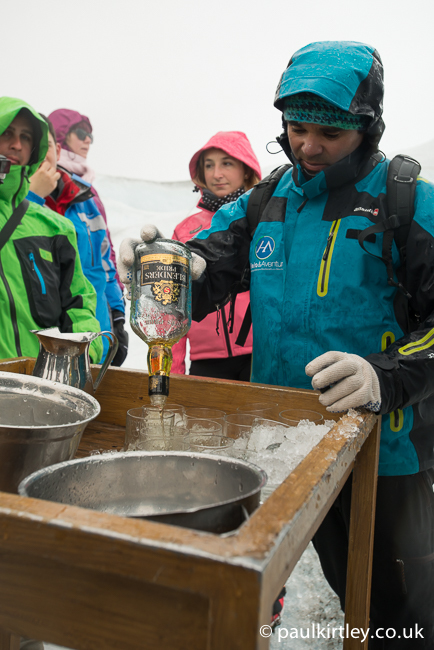 Before we did so, though, we congregated just off the ice and our guide explained a few safety points such as the necessity of wearing gloves to protect hands from sharp ice, as well as giving a practical demonstration of how we should walk while wearing crampons. It was all relatively basic but thorough and provided everyone in the group with the necessary knowledge to negotiate the short hike. 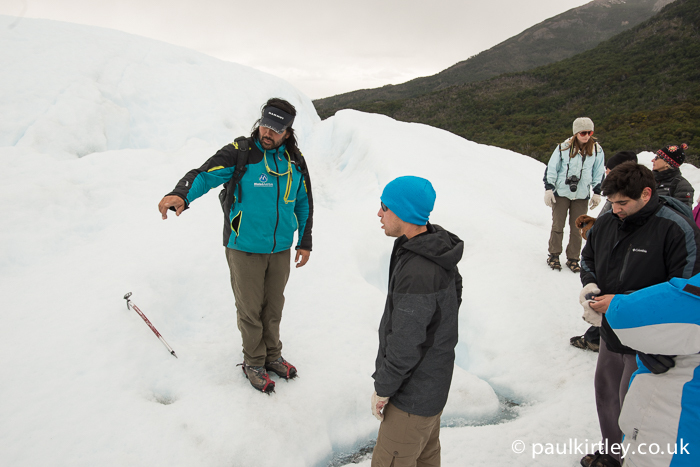 Once up the first short but relatively steep section onto the glacier, our guide stopped to explain a few more things. Photo: Paul Kirtley. 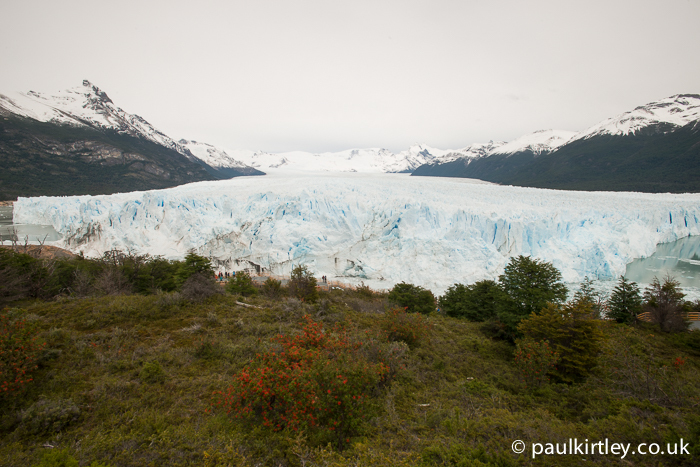 Perito Moreno is a warm or temperate glacier. 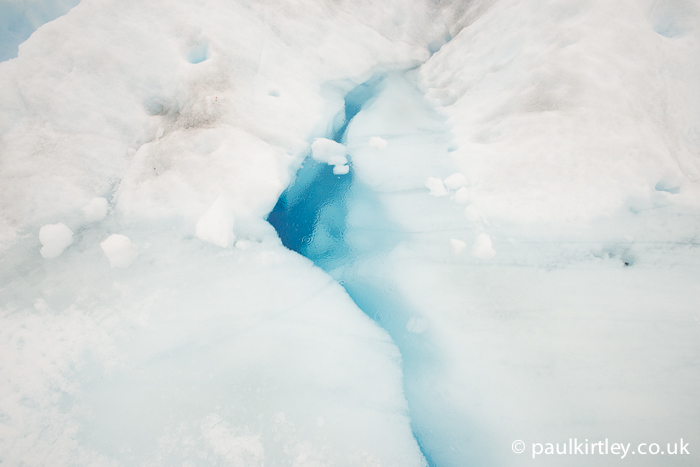 A practical effect of this is that there is water flowing on the surface of the glacier. 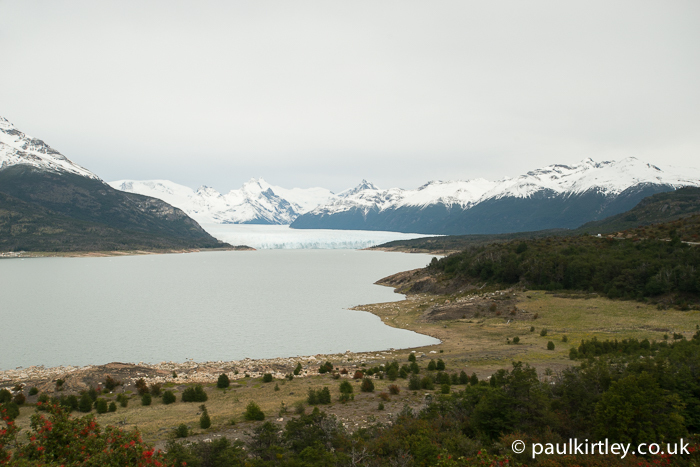 The lake below Perito Moreno is actually only 180m above sea level. 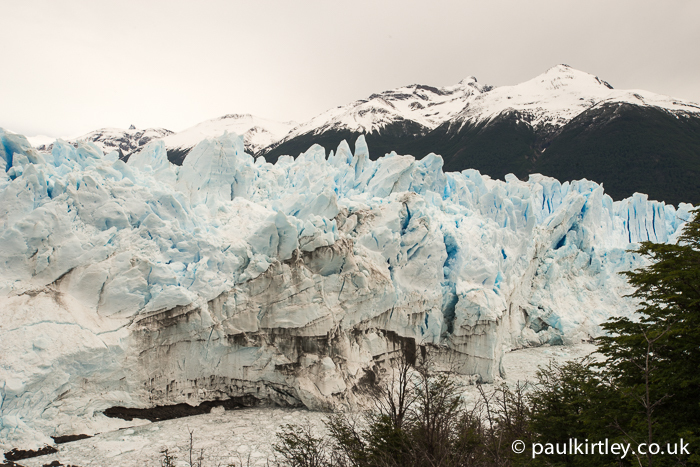 The ice in the glacier was orignally formed up in the mountains between Chile and Argentina at around 2,000m above sea level. Where we walked the glacier is around 200m (650 ft) thick, while at its centre the glacier is estimated to be around 700m (2,300 ft) thick. 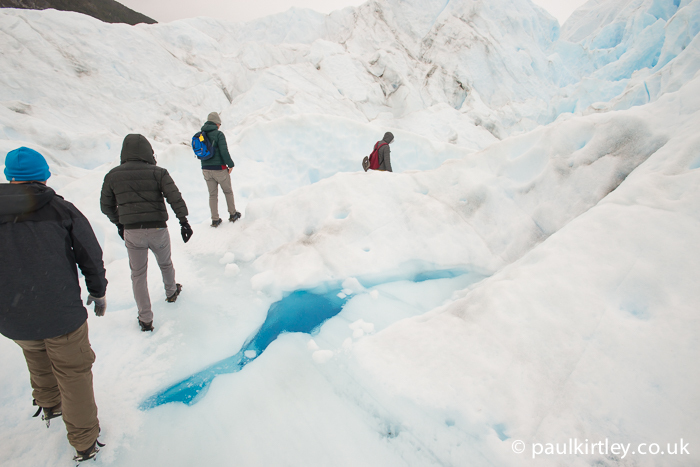 Water flowing on the surface finds its way into cracks and glacier mills or moulins, which carry melt water from the surface of the glacier. Some of this water can find its way to the base of the glacier, where it acts as a lubricant between the glacier and the rock underneath. 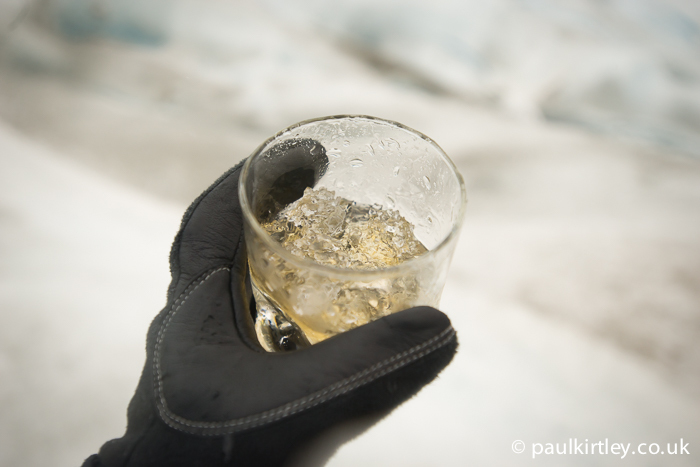 Despite this, there remains a lot of pressure and grinding of rocks under the ice. The rocks are pulverised – literally turned to dust – the resultant “rock flour” is a very thin and light dust. This dust, suspended in water makes it cloudy and gives glacially-fed lakes and rivers their distinctive milky appearance. The two guides we had were very good. I have a number of outdoor leadership certifications and I’m always interested to observe other outdoor leaders and guides at work. 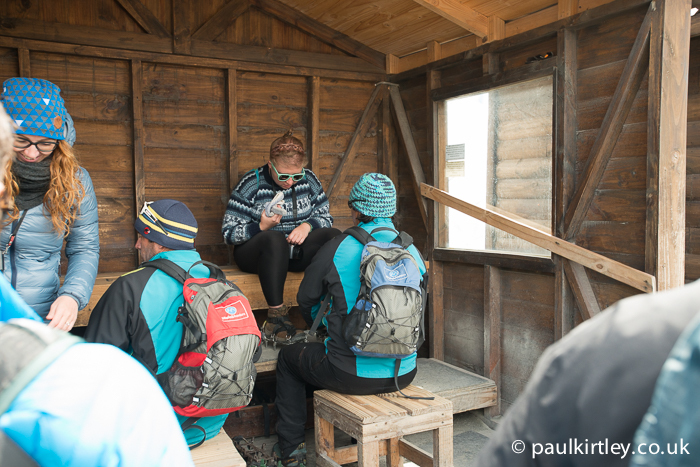 There’s real scope for learning and gaining a different perspective, particularly if the activity is different to your day-to-day outdoor leadership, either in terms of activity or environment. I was enjoying watching the individual leaders here as well as how the whole organisation worked to manage a large throughput of guests. Specifically, our guides always put themselves in useful positions. They were always very helpful, never showing off in any way. 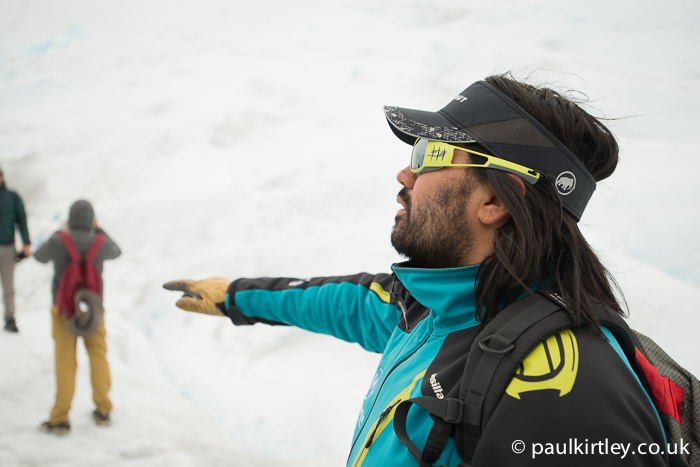 The main guide, who gave us all of our briefings and talks while on the glacier hike interspersed the factual points with light humour. I particularly liked his wry comment that “serac is a French word which means serac”. They also kept control and didn’t compromise with respect to points of safety. Our guide reprimanded a few young men who clearly hadn’t listened to the initial briefing about walking in single file and not cutting corners. But he did it politely and fairly. 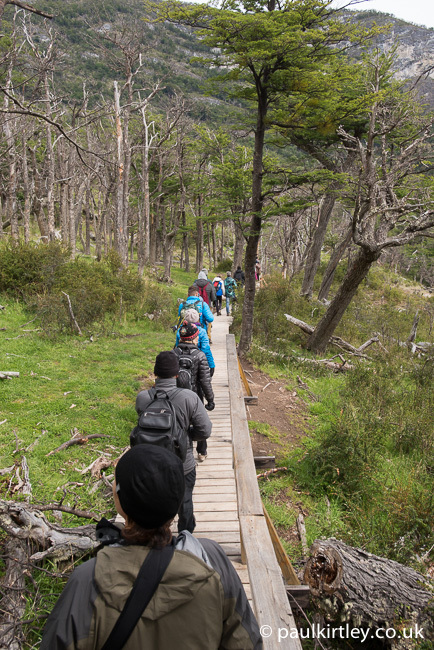 Most of the time the main guide led from the front and the second guide variously stayed back or ran ahead to help people on steep sections or steps. At other times, they put themselves between the group and larger objective dangers such as steep slopes. 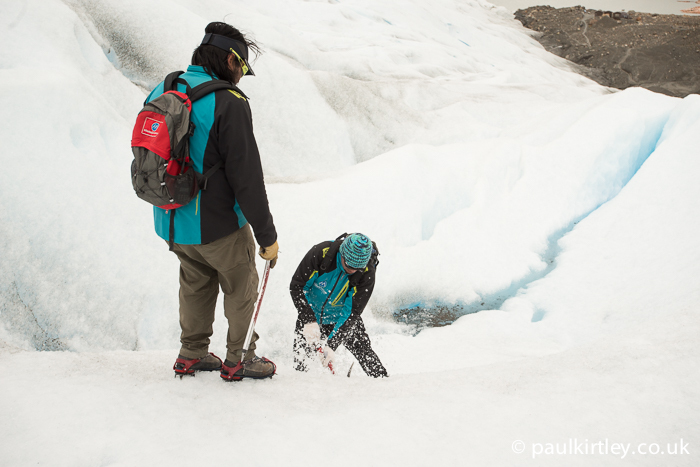 On one occasion they both stopped and put themselves between the group’s route and a crevasse, one of them first clearing a nearby trip hazard with his ice axe. Here, Amanda and I were at the front of the group and our main guide asked us to walk as far as a particular point then stop to wait for him. This point was in view of where he was, before a dip where we would not have been visible. In doing this, the guides kept everyone in their sight. Moreover, none of these leadership decisions were made in any sort of showy way. I only noticed them because I noticed parallels with principles such as position of maximum usefulness in the acronym CLAP as well as some principles from the Mountain Leader Award. Other times the guides put themselves between the group and the largest objective hazard. Here, for example, the two guides are in the middle of the picture between hikers and one of the larger crevasses we passed. Photo: Paul Kirtley. 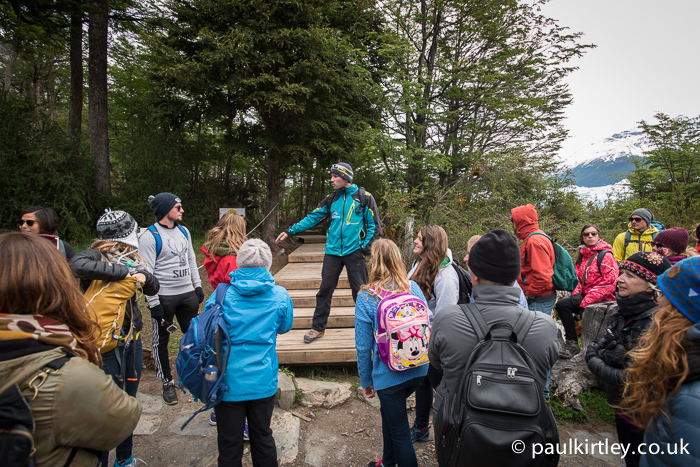 Our main guide did a great job of adding an educational element to our walk, regularly stopping to point out and explain various features of the glacier or ice. One such feature was what he referred to as “cryo cones”, more fully described as cryoconite holes. Cryoconite is windblown debris on the surface of the glacier and cryconite holes are caused by the differential heating and cooling of this material vs the ice. Dark objects absorb more radiation than the surrounding ice and heat up, melting the ice beneath them at a faster rate. Dirt and small bits of sediment result in narrow pockets, bigger rocks, stones and pebbles can form bigger holes. 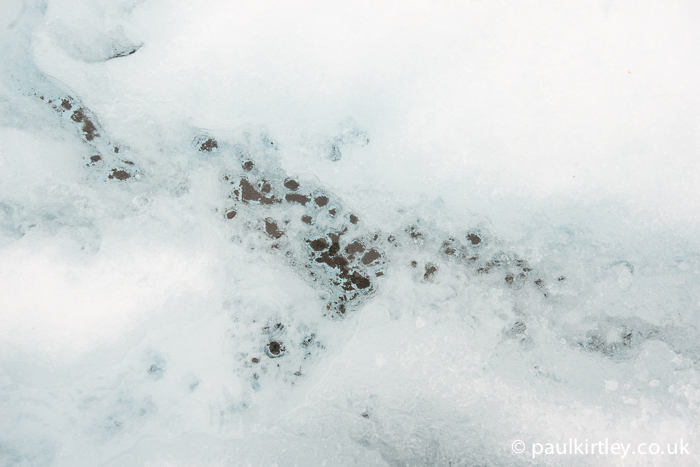 Even leaves blown from trees and carried by the wind onto the glacier can form these holes. One of the features we stopped to look at were cryconite holes. Photo Paul Kirtley. I’m not normally a fan of packaged cookie-cutter tourism, particularly when it comes to outdoor activities and experiencing nature. 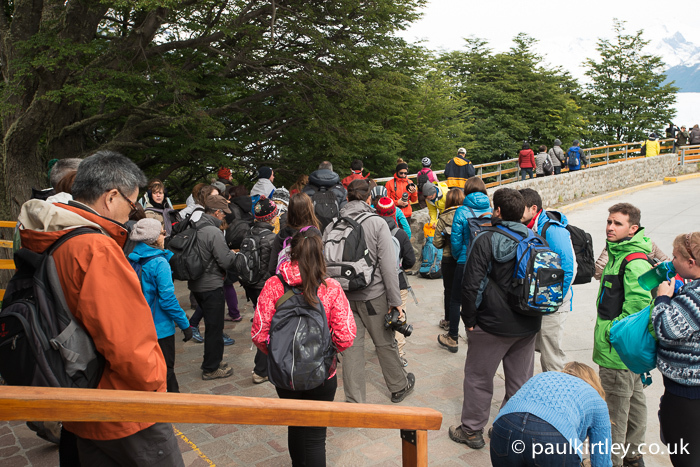 I also tend to avoid tourist honeypots, at least when they are busy (I’d rather go to the summit of Snowdon in winter than in the middle of summer, for example). Call me slightly misanthropic if you will, but that’s just what I prefer. 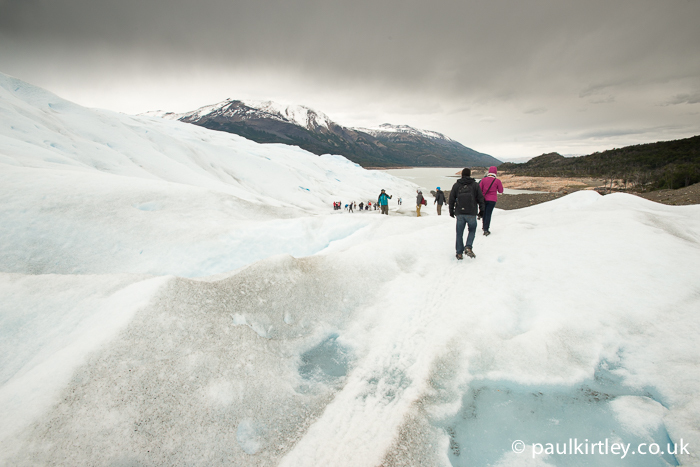 Perito Moreno is unique, though, and it’s very difficult to visit the glacier in any other way than tramping the public walkways or using the only company which seems to have permission to lead hikes on the actual glacier. 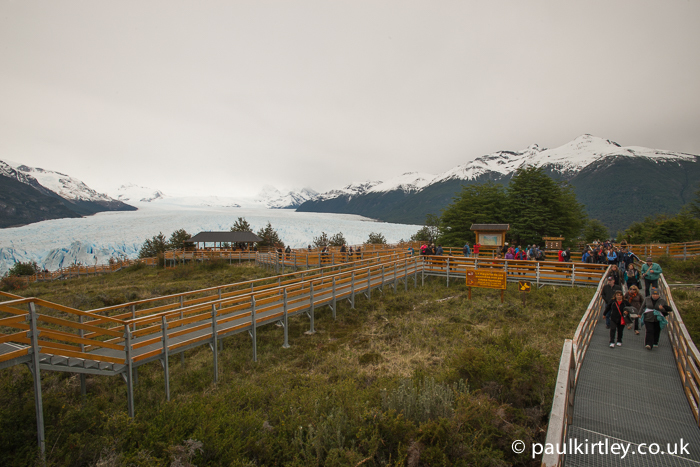 Ultimately, the infrastructure and organisation around the glacier make it accessible to many folk yet minimises localised environmental degradation by making use of steel walkways and wooden board walks. 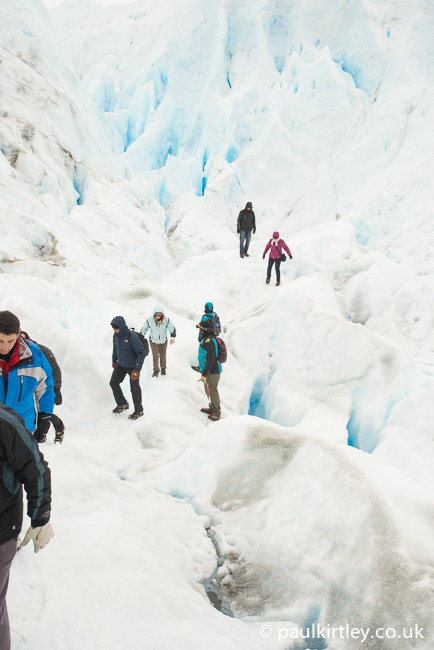 While personally I would have preferred to undertake the longer, more involved glacier walk, I can’t deny the shorter, more moderate walk does allow people with no mountaineering or glacier travel experience to have a taste of walking on the ice. 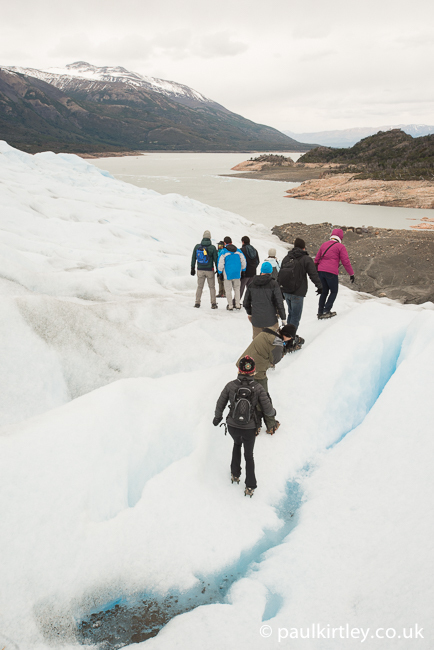 Moreover, Patagonia is a land of packages and fixed itinerary tours. I’ve never been anywhere like it in this respect. I’m used to being a lot more independent when making journeys, even day hikes. 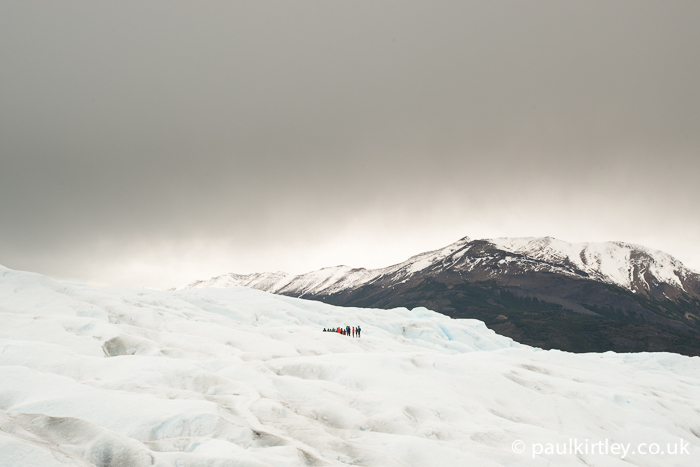 We did a better job of suiting ourselves when we headed further north after a spell of being based in El Calafate. Despite some prior apprehension, I have to say the trip on Perito Moreno was well-run right from our pick up in El Calafate to managing our group to be in the right place at the right time during the day (without being heavy-handed), through to making sure we were on the right transport back to El Calafate. It was seemingly relaxed yet slick. Plus it was interesting from a professional standpoint to experience the collective organisation and systems in place, which handled a high throughput of visitors, as well as observe how the individual guides on the glacier conducted themselves even though their groups were relatively large and there was little time available to build up any rapport. It certainly provided me with food for thought with respect to my own business. It would have been good for some of my team at Frontier Bushcraft to have observed all of this too. Thank you so much for posting those incredible pics. What a wonderful trip that must have been! Thanks for sharing! Really interesting article! I am currently building up my QMD’s before I do my summer ML training and your article provides some really thought provoking insights into good leadership and what it looks like. 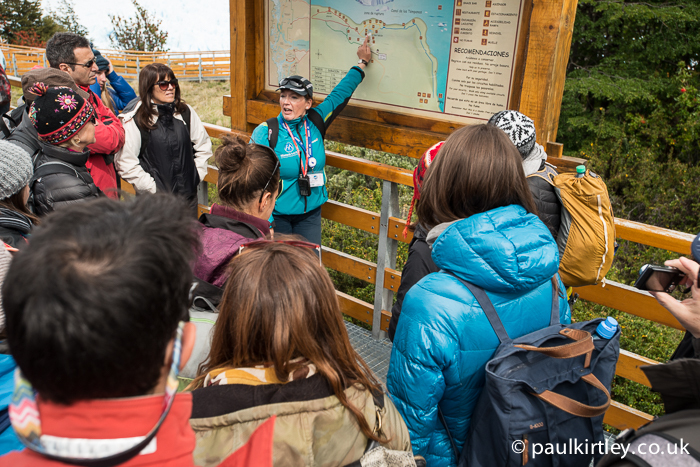 I was particularly interested how the two guides worked together to lead the group and by the ‘non-showy’ way they made their decisions and communicated these with the group. Thanks again for a great article. Now this brought back some great memory’s. I was there around 12 years ago. 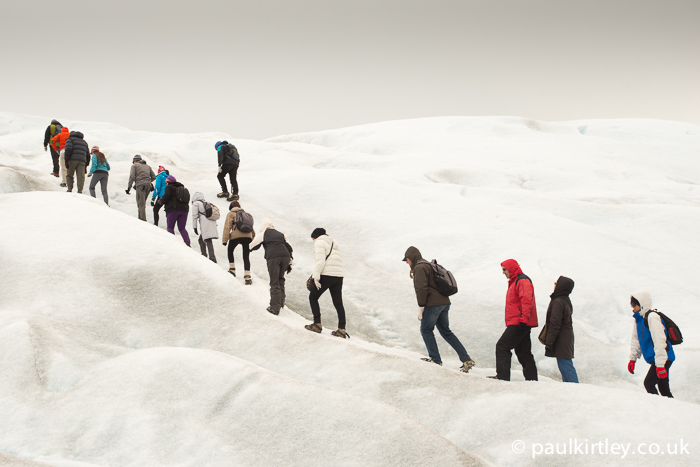 And I did the walk on the glacier,but at the time I think they only did the longer walk. Anyway that’s the one I did. It was late February early March time. And at that time of year you can go into ice tunnels that run through the glacier. Which was very surreal crawling along them,only to get to the end and try and turn round or crawl out backwards. And thinking back the guides where good and very knowledgable back then as well. I also remember stopping at the Whiskey station. I’m not keen on Whiskey normally but I enjoyed that one. It must have been the very fresh glacially ice. It’s still one of the best things I’ve done.